I wanted to switch up my overnight oats and make something festive for Valentine's Day. 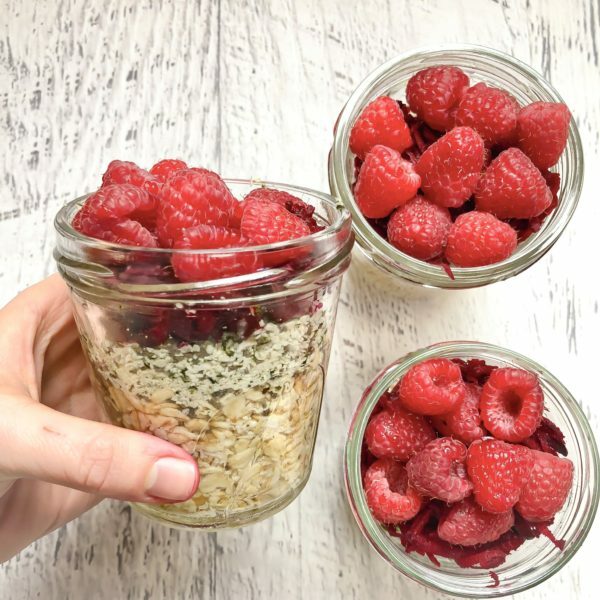 This refreshing combination of heart healthy oats, beets, and raspberries ticked all the boxes. The betalains in beets and the anthocyanins in raspberries provide the vibrant red color. These compounds are antioxidants (cell protective) and are anti-inflammatory. Remember- when it comes to real food (not candy! ), the brighter the color, the more nutrient dense. Make this recipe over the weekend to begin each week day with superfood plant power. Start by shredding the beets and the apple in a food processor. Note: I purchase vegetables whole (not pre cut or shredded) to avoid packaging and enhance the nutrient quality. Line up the 5 jars and add 1/2 cup of oats, 1/5 cup of water, 1 Tbsp hemp seeds, 1 Tbsp coconut, and 1 tsp chia seeds into each jar. Then add the shredded beets & apple and raspberries evenly to each jar. Mix to combine, or leave layered! Store in the refrigerator for the week!